NEW YORK (WABC) -- It's like the saying goes, 'If you see something, say something' - but what about 'If you see something, drink something?' 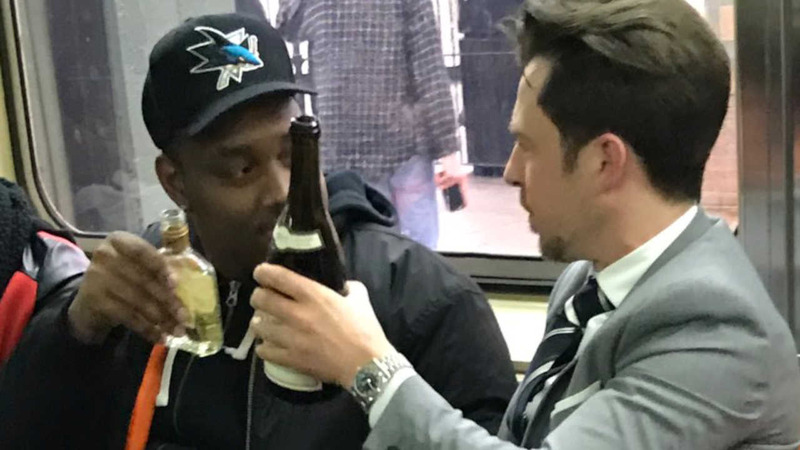 That was the case on Saturday when unsuspecting 6 train riders were surprised with a bottle of wine that rolled out from under one of the seats. Journalist Colleen Hagerty documented the beautiful 'Only in New York' moment as it happened early Sunday morning just after 1:00. Two strangers popped open the wine and started to drink it. In a post on Reddit, a friend of Hagerty explains reportedly what went down at the time. The friend also added that the wine bottle was a pop-top, so there was no corkscrew required. As you could imagine, the responses to Hagerty's tweet were hysterical. @colleenhagerty @TimOBrien Opening scene of NY NY Land? @colleenhagerty @pencil_skirts New Yorkers would never drink something that touched a subway floor. Get out. @colleenhagerty those people are crazy. No way I'm drinking anything that rolls out from under the seat of subway. So what's the moral of this story? Always look under your seat, because you never know what you'll find!